In these photos, we can clearly tell that this is, indeed, an SQ8 and not just a regular Q8 SUV thanks it is quad exhaust pipes. Two of which are suspiciously colored white, seemingly to throw us off its scent. Though, we can all clearly see them and quad pipes mean it’s an Audi “S” model but not a full-blown “RS”, the latter of which would have massive dual exhausts. Aside from that, this Audi SQ8 looks pretty humdrum. It has some front air intakes that feed intercoolers and some large wheels but nothing that really makes it stand out as a performance model. Although, Audi “S” cars have never been wild looking, so this is no surprise and this could also be just a developmental test mule that doesn’t have its final body work fitted. Either way, we’re not really expecting it to look too crazy, just a bit sportier than the standard car. The Audi SQ8 is rumored to be powered by a hybrid powertrain, which is said to consist of the same 3.0 liter turbocharged V6 that you’d normally find in an Audi S4 or S5, but with an added electric motor. According to Motor Trend, that hybrid setup could allow the Audi SQ8 to have up to 470 hp, which is nothing to sneeze at. It will also give it impressive torque off the line and decent fuel economy. In these photos, we can also spot that Audi was testing the SQ8 alongside a Porsche Macan. While the Macan is a rung or two done on the ladder compared to the SQ8, it could be there as a dynamic benchmark. After all, the Macan is probably the best driving small SUV on the road. 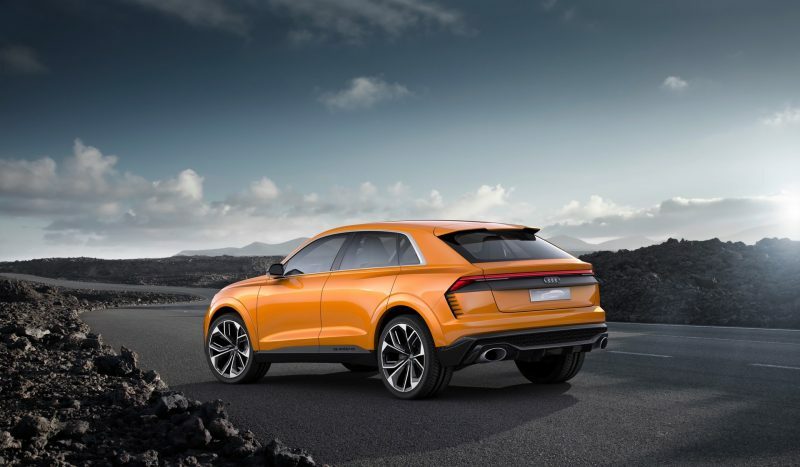 We’ll see the upcoming Audi Q8 and SQ8 later this year, as it will start production in 2018. Is the new B9 Audi RS4 Avant the best RS4 of all time?